Last night at The Practice our community was masterfully led in a concert of Lament & Hope by our dear friends The Brilliance. I don’t want to sound hyperbolic, but I am genuinely amazed that this experience got to happen in the context of church. I may be overstating my own experiences, but growing up in the church, I have always wrestled with a glass half empty vs. glass half full mentality when it comes to worship. Most of my experiences of worship have focused (and I believe rightly so) on the glass half full – offering up thanksgiving, praise, and joy to God for who He is, what He has done for us, and how we are changed as a result of the beautiful exchange that took place through Christ Jesus. And don’t get me wrong, I desire and long to spend the majority of my headspace and my heartspace dwelling on the hope we have received and look forward to in Christ. But there have been other times in my faith; low times, depressed times, disenfranchised times – in which my head and my heart haven’t been willing to go there, or more importantly, haven’t been able to fake being there. In those times, I so badly wanted to be in communion with God, to wrestle with Him, to speak my fears, concerns, and pain to Him – but I was never sure if I could talk to God about the glass half empty that I saw. I was afraid that these periods of doubt, sadness, and confusion excluded me from relationship with God, that they had no place in the church, and the saddest thing about this, is that the one I wanted to lay it all before was God. My glass half empty wasn’t a declaration of apostasy – it was an ache for deeper intimacy with my Maker. So to experience a concert of lament and hope within the walls of our chapel – was a beautiful, and profoundly redemptive experience for me. 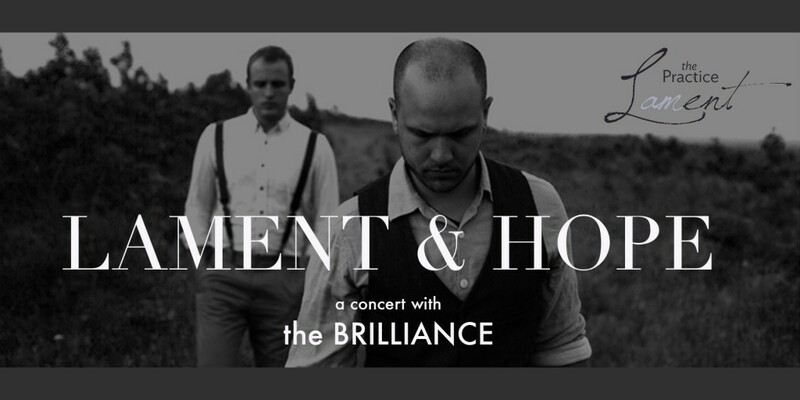 The Brilliance are in some ways, a modern liturgical marvel, writing a stunning soundtrack to lyrics expressing protest, pain, and sorrow all in the spirit of lament. Woven throughout this refrain were readings from Psalm 88, songs of lament & hope (you can listen through their album for more), and eventually two stories of lament from our dear friends Sam Ogles, and Joan Kelley. I am deeply grateful for both Sam and Joan in my life, for the deep and sincere faith they live out with authenticity in both the joy and the pain. Sam poetically shared his story of lament over an anxiety disorder that claimed much of his childhood and now claims his sister at times – Joan courageously and beautifully shared the ways in which her family has creatively lamented the death of her teenage son Will due to cancer. I listened to their bold yet tender stories of lament, and I felt at home, I felt known in their sharing, and I felt like I knew them – through the pain we allowed to share space with us that evening. From these stories we moved into prayers for the world that protested the ways in which we have contributed to systemic problems of race, gun violence, pollution and inactivity in the church that keeps us from loving one another – it was a powerful and sobering time of prayer that reminded us all that we are part of the problem. that love Is all around you its all around See how it lights you up. I hope that each of you were sent out in this spirit, desiring to see God’s love all around you and the world we were sent back into. As we close this chapter on lament in lent, I am truly blessed to have journeyed this path with each of you. It is a rare and precious experience to grieve and cry and hope together in the same space, bearing one another burdens in the healing name of Christ. May you carry lament with you as a tool for the days in which your cup is half empty, and in so doing, may we all find through Christ a cup that is overflowing with love, grace and peace.